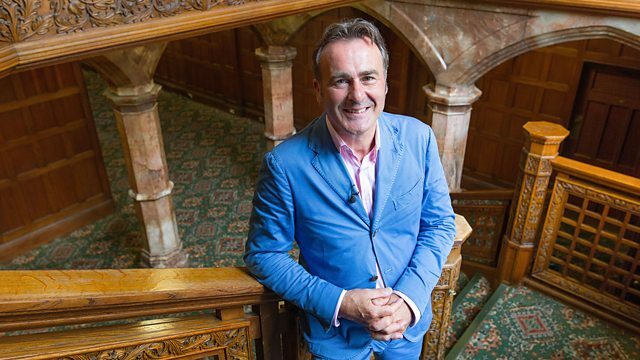 Cheltenham ‹ Series 10 Reversions ‹ Flog It! Paul Martin and experts David Fletcher and Adam Partridge visit the Pittville Pump Room in Cheltenham, where Adam finds an item that is every auctioneer's dream. Browse content similar to Cheltenham. Check below for episodes and series from the same categories and more! to its popularity as a spa town in the 18th and 19th centuries. And this iconic piece of architecture, look at that. our venue for our valuation day. in the 1820s by local entrepreneur Joseph Pitt. and the area known as Pittville is now a thriving suburb. I think it is a booming success. This lot are here to get their antiques valued. When you've found out, what are you going to do? ALL: Flog it! That's the name of the game. We've got the experts, you've got the antiques. Let's party. looking for the very best antiques and collectables to send to auction. ..and the young pretender, Adam Partridge. -Do you? I'm going now! -Is it something you want to sell? -I'll be talking to you a bit later. You'll find out what that's worth in just a moment. Adam's whipping up interest in the audience. "Wow." I heard a "wow". That's great. What do you think of this? isn't all it should be. -I was pleased to see you come in with an autograph album. because I thought you were going to ask for mine but you didn't. And all that to enjoy, so let's get on with the show. Our experts are straight at the tables. It looks like Adam Partridge is first to spot a real gem. Let's take a closer look at what he's found. You've brought along this very nice gold chronometer. -It's got a stopwatch function as well, hasn't it? to help this particular colleague of his out. -So you said, "Go for it." because at the end of the day it is a bit of an investment. -And roughly when was this? That's a nice story. Was it a good friend of his that he was helping? -I should imagine so, yes. -The largest English watch manufacturer. It's a great piece of engineering. It's a pocket watch. It's got a stopwatch function. I'm just going to open it up actually first. Oh! -It is quite difficult, yes. -There. But it's nice quality. -It's not falling apart on us. -It's still nice and tight. There's the 14 carat mark. -also the number on the dial. You know, it's not a marriage being made up of other bits and pieces. -It's also got the number on that as well, the case. -and the case number on the movement there. The movement signed, "H Samuel, "Market Street, Manchester." -So this is the original head office. There must be some sentimentality involved here. while Eddie was in the Royal Navy. so we'd like to go back for our anniversary in September. So anything we make, we'll put it towards the slush fund. -Yeah, I'm a bit of a romantic. -I think that's a lovely idea. and they will make more. that it's not great news for you. we can up it a little bit without scaring people off too much. -Gold prices are pretty much an all-time high. -and put 250, 350 estimate. -That sounds good to me. it goes home with you, but it is a lovely object, great condition. -The case is all there and the owners are charming as well. So it's got everything going for it. We do love a bit of romance on "Flog It!" So we'll do our very best for Eddie and Maria. hundreds of people with smiles on their faces. and look what I've just come across. You've got a gavel in your hand, Mrs! -Haven't you? What's your name? Marjorie, what are you doing with a gavel in your hand? -I brought it to have it valued. and Adam Partridge, would love to buy something like that, wouldn't they? Every auctioneer on the programme would. -I'd like them to buy it as well! -But you know, they're not allowed to. It's a gavel that turns into a propelling pencil. to sign a cheque or something. It was easy to carry in a handbag, that's why I brought it. -Look, good luck with that. -And I love the programme. what he thinks it's worth, but before that, David's found his first item. He's with Jenny, and she's brought in a train set. so I suspect this isn't yours. -No, it belongs to my grandson. When did your grandson acquire it? -because he was mad on trains. But it wasn't Thomas, so he didn't want it. No. It's a bit older than Thomas the Tank Engine. Or at least for older boys, I think, than Thomas the Tank Engine. -How old is he now? -So that was ten years ago. And happily, he hasn't played with it, has he? No, he hasn't even touched it. And he's gone off trains. or as a passenger train by using the carriages there. and is one of the big names. -because this box is marked, "Made in Western Germany". And of course, Germany was reunified in 1989.
so that might possibly be made a few years later. -when it was given to your grandson, it was second-hand. -Do you have any idea what it might be worth? but I would be tempted to go for an estimate of 40 to 60. And I would really suggest that we sell without reserve. if we put a reserve on it. And what will your grandson do with the money? and see an Arsenal game. -Go and see Arsenal play? So you might have to pay for the train fare to get him to London. -Let's hope we make enough for the ticket. we'll need that to really sell well. Now, I recognise our next owner. It's Marjorie, who had that unusual gavel. where she's talking to Adam. You've brought something that I really like. Tell me about it. -that's in the shape of a gavel. and he brought it and said that if I brought it, you would like it. -He was right, wasn't he? -and they were the inventors of the propelling pencil. And many people see them in silver, in different novelty shapes. -I've never seen one of these before. -Haven't you? Oh, that's good news. -the result and then write it down, couldn't you? I think that is lovely. So your husband is obviously a bit of a collector. He does, yeah, he collects odd things. Including me! You could see my mind working, couldn't you? and then he keeps them for a few years and then he sells them on. -It's a good hobby, isn't it? -Dabbles a bit, that's all. -So this delightful little thing set your husband back how much? That's quite a strong price, I think, isn't it? -But it was worth it. -It was worth it. It was worth it. -But to some people it may not be worth it. -But obviously he doesn't want to lose any money on it. -that I think we could try it at £200 to £300. Wow? I heard a wow! That's great. -What do you think of this? -Would anyone give £200 for this? -You would? There we go. We've got a buyer already. -you're always going to get a good price. Shall we put a reserve on it? -180, OK. Pop in a reserve of 180. Now, over on the other side of the hall, I've found a real beauty. -Angela, thank you for coming in to the valuation day. I know what you've got is very precious. -It's not in your pocket, is it? -It's not wrapped up in a bag. -No, I haven't lost it. Boxes full of bubble wrap. Come on, show me. -That's a sparkler, isn't it? and then put it back in the box. -And get dazzled by it? -It must be so nice to wear a ring like that. -And watch everybody go, "Oooh!" When you're signing a cheque or something or... "Oooh!" -The cut is quite important, isn't it? ..so the light goes underneath them and it sparkles even more. And the centre, the centre diamond looks like a four-carat. -It's a four-carat, isn't it? -And the other's a three. My gut feeling is, that's a four grand ring. -Now, in auction, maybe a little bit more. -it might be an eight grand, might be a £9,000 ring, mightn't it? for £4,000 in a jeweller's? You're not. -this will create a buzz, and a sparkle in the room. hopefully a little bit more. -And then Philip can take his commission. and also finding out exactly what it's worth. and today we're going over to Malvern to Mr Philip Serrell's saleroom. He's going to look after us. He's on the rostrum, so we're in safe hands. We've got our first four items. Now we're taking them off to the sale. But which one of them will create the biggest storm in the saleroom? Stay tuned and all will be revealed. for the sale in Malvern. a top-quality gent's pocket watch, and Adam's here with the owners. -Will it get the top end? -I think we've pitched it about right. Why are you selling this, Eddie? -We'll put it towards that. -And that's where you met? -That's where we met, yeah. -We've got to get you there. -Or at least something towards it. -At least to the airport. Lot number 590, 14-carat gold open-faced watch. 210, 220, 230, 240, 250. At £250 only, at 250, is there any more? At 250, there is the bid. Lot number 590, at £250, any more at all? At £250, and I sell, then, at 250, and done. Yes! £250. That's not bad. -OK, enjoy it, won't you? -Yes, we will. Thank you very much. -Spend it on a bit more jewellery out there! and that leads us to our next item. to buy an Arsenal ticket for her grandson. and some of it is boxed. We've got that, but unfortunately, we don't have our owner, Jenny. -and we're looking for around about £40 to £60 for this. with the top end of the valuation. It's going under the hammer. Here we go. Number 418 is the Marklin train set. There you are. There's the whole lot of it. Bid me for that, someone. Start me off wherever you want to be. I'm bid £20 for that. Lot at 20. 20 bid. And five, 30. At £60 only, at 60, is there any more at all? At 70, at £70 only, at 70, any more? I'm pleased with that. Good valuation. Well done. -And I think Jenny will be as well. They're difficult things to value. but there always is a market for them at the right price. and they'll always buy that sort of thing, you're right. -Even if it's for spares or one or two boxes. Let's hope Arsenal win that game as well. Next is our auctioneer's gavel. who better to ask than auctioneer Philip Serrell? I spoke to him at the preview day. I think every auctioneer should own one of these gavels. but not like that, do they? No, not with a propelling pencil. if she bought this for you. -Have you had a word with her? and I know that they'd just love to talk about it. Well, sadly, you know, all auctioneers collect gavels. That's something every auctioneer likes to hear. on the telephone saying, "Philip, how much is that gavel?" -All of our experts as well. How many of those have you seen? I've never seen one with a propelling pencil inside it. I think it's probably worth 150 quid. -I think it's going to make between 250 and 300. Yes, which is spot-on, really. Adam's put £200 to £300 on this. Well, this will be going under the hammer very shortly. I can't wait. are on the saleroom floor with me. your husband bought it for around £180-odd. -It's got to be worth that. -I can feel a profit! -You can feel a profit? -Me and my big mouth! -But I can feel a profit. -It's your fault if it isn't. A Samuel Mordan ivory propelling pencil gavel. I'm bid £150, bid at 150, 150, 150. At £200, 210 with me. At £210. 240, 250 with me. At 250. -There is a profit already now, isn't there? I told you, didn't I? Didn't I say they'd fall in love with it? At 310, at 310, 320. At 320, on the telephone, the book's at. At £340, is there any more at all? At £340. Any more? The bid's on this telephone. -Your husband that bought it, wasn't it? He's got a good eye. -That's a good result. A good result. -I agree with you on that one. What did your husband say? Did he know on the day that you were going to sell this? "Take this, you'll get on the telly." I said, "I don't want to be on telly." There you go, you got on the telly. But he said if it sells, he's taking me to Venice. -So I'm off to Venice now! Up next, my favourite item of the show so far. -and it is a bit of a whopper, isn't it? So you're happy with the new reserve? We got a fixed reserve of £3,200. There's a big smile. Your smile is a sparkle enough, isn't it, really? Let's find out what the bidders think. Here we go. 2,500 I'm bid, at 2,500. At two-seven, 50 anywhere? 2750. -We're nearly at the reserve. You're out. Three-two, the book. At 3,200. Is there any more? Book's in, you're all out. -and done, then, at 3,200. -It's gone on the reserve. -It's gone on the reserve, right. rather than it struggled at 35 if we did have that reserve. -You'd be taking it home. -For the sake of £300. And that is a lot of money, still, isn't it? Oh, it will go a long way, yes. That was close, wasn't it? Some of them are close. -You are a living on a knife-edge in this business. Well, there you go. That was fast and furious. of our first visit to the auction room today. I'm going to go off and do some exploring. and be meeting the present-day lady of the manor. This is Sudeley Castle in the beautiful Cotswold Hills. It's steeped in history, with royal connections spanning 1,000 years. by opening it to the public for part of the year. to the dramatic and sometimes violent history this castle has seen. At one point, it was nearly destroyed. and proved to be the perfect foil to an ill-tempered king. then owner of Sudeley Castle. when King Henry declared his interest in her. until her death a year later. to a purpose-built new tomb here in the Chapel of St Mary. and carved by master mason S Birnie Philip. And I have to say, the detail is exquisite. Sudeley once again played an important part in English history. It went horribly wrong. They lost the battle. and one young officer said, "Sir, can we go home now?" The King replied, "Well, I have no home to go to." were offered refuge here at Sudeley. or made untenable as a military post. This involves removing the roof and exposing the inside to the elements. and these tumbledown walls have been left as a reminder of that dark time. spotted the ruined Sudeley Castle whilst out riding. They spent most of their wealth purchasing it and restoring it. Sudeley Castle is still owned by the family of the Dent brothers. married one of their descendants more than 40 years ago. She's been instrumental in opening the castle up to the public. You open to the public, and I know you're opening in a few weeks' time. -It's like putting on a play. Well, it's the sort of frenzy of the last-minute build-up to opening day. -The grounds are magnificent, they really are beautiful. living in such a historic house. It is kind of extraordinary. the history is very tangible. that's why people come to Sudeley. This is a historic house. It's not really a stately home. It's partly a ruin, as you can see. This room is an interior designer's dream, isn't it? I can see your touch everywhere. It's beautiful. because it's an earlier part of the castle. -and drink beer and, you know, carry on and everything. that wouldn't have been panelled back then for such a room. -in taking the panelling down. Could you imagine sitting here now with just oak panelling everywhere? These colours wouldn't work. Nothing would work. Now you've let the room breathe again to how it should be. -I'm glad you like it. -and artefacts you've got here are the very, very best. -There are some marvellous things. -And you use them every single day. There's no ropes around them saying, "Don't touch". You actually use all these wonderful things. -being used for the purpose that they were intended for. -on a day off and spend the whole day here, so thank you. is the Pittville Pump Room in Cheltenham. their unwanted antiques and collectables to be valued. We're ready to take a look at the next item with Adam. -Welcome to "Flog It! ", Lynn. -It's very nice to see you brought some interesting items along. These very colourful cloisonne vases. -Japanese. Do you like them? And where did you get them from? How did they come into your possession? -I've had them about a fortnight. They were left to me by a cousin. I picked them up from the solicitor about a fortnight ago. -And you've taken them home. -And sort of thought, "Well, where am I going to put them?" It was really a case of, they didn't sit well in the house. -Do you know where your cousin got them from? All I know is that she travelled quite a lot with her first husband. Do you think she went to Japan? I wouldn't be surprised. She was quite well travelled. -Quite a cosmopolitan lady, was she? Well, they are cloisonne enamel, they're Japanese. this technique called jinbari enamelling. And they're really rather nice, I think. Have you seen any damage? This one has got damage there. A little bit of a blister there, isn't there? Is that something that was done during firing? and you'll get a little star crack or bits coming off. -So, yes, that does affect it quite a lot. In terms of age, they're not massively old. They're 20th century, they might be '30s, possibly later than that. But they're very, very decorative. What do you think they are worth? -I haven't got a clue. -And you're selling them anyway. Even if I said they're worth 20 quid? -All right, well, they're worth more than 20. But not much more. I think they'll make 60 to 100 between them. because if they don't make £50, then they're not worth selling. -and trying them another day or something like that. Does that sound all right to you? but will it pay off? Now for something slightly more modern. Michael is at David's table with a table. We so rarely see this sort of thing on "Flog It!" When did you buy it? -'68, and you'll have bought it new? in the 1960s, this sort of furniture was the height of fashion, really. Yes, it must have been, yes. -Can you remember what you paid for it? -and apart from the decoration on the top, that's it. All those sorts of things are just dispensed with. is the fact it's decorated by John Piper. -Or at least after John Piper. of the 20th century. His life spanned the century, very nearly. represented on a table like this before. It's curious, really. You have these amazing classical baroque buildings. -They're all after Christopher Wren, I think. so, you know, as was so often the case in the 1960s, anything went. You know, you could mix and match, and people loved it. -But I wouldn't want to sell it for less than 100. So would you be happy with a reserve of £100? -Yes, would be happy with that. You haven't been using it? -No, it's been in the attic for 20-odd years. -You thought you'd come along. I look forward to seeing you at the sale. And our next item - well, it's a suitcase. Alison, underneath this canvas cover I know there's quality, isn't there? It wouldn't have a canvas cover on it otherwise. No, they belong to my mother. -You're obviously not still a Secret, are you? -No, I'm not. No, no. -or a mark on there. that's the best hide money can buy. -Oh, it's just divine, isn't it? It's just getting better and better, isn't it? Do you know, it's never been used, has it? Very, very nice. It's all there. -I could see it in the back of a Bentley, couldn't you? -Is it by Mappin & Webb? It's clearly not really been used. -This lifts out, doesn't it? And then you take that off with you. -Have you any idea of value? this is possibly the best example I've seen for quality and condition. -Why do you want to sell this? Half of it belongs to her and half of it belongs to me. So the best thing to do is to split it. Split the money. So let's be a bit gutsier, OK? -£800 to £1,200 on this. And hopefully, it does the top end and a little bit more. I am very happy with that. We'll protect it with a reserve...? I'll tell you what we'll do, let's give it discretion. with a discretion of 10% at £800. -That'll make the bidders keen. I'm pretty sure it'll go at the top end. But I can't guarantee! I can't guarantee what's going to happen on the day in auction. and even the best valuations are in the fate of the bidders on the day. We need one more item to send off to auction. and he's with Mervyn and a childhood collection. for mine. But you didn't. Whose autographs have you got? Shall we have a little look? OK. You've tagged all these, I see. -Right. Yeah. Laurel and Hardy. I collected them from the stage door of the Birmingham Hippodrome. -When I was a youngster at school. -this autograph album for you. So they've handled this very book. Yes. Names I know as well. Guy Mitchell. "I've never felt more like singing the blues." What was that - '50s I suppose? -I was about 13 or 14. -And hang round the stage door. And I collected them then. -the theatre and in films? -But you're not collecting autographs any more. -Although I did get one today, a very special one. -Which must be worth a lot. It's next to Laurel and Hardy's, actually. The next page. The next page. There it is. -It's worth £100 to £150, in my view. -And if we put a reserve of £100 on the lot, say? to spend the money on? -where she can take it back if she's not satisfied. -Does she often take things back? -really nice that she won't want to take back. will want to snap them up. for our auction, at Philip Serrell's saleroom. £110, there's the bid... Done. owned by Lynn, and spotted by Adam. These were left to me by this lady. Yeah. She left me these items, hence why I brought her today. and I believe the red one's got a bit of damage, hasn't it? Little bit, yeah, cloisonne's very prone to damage, isn't it? -I think we've reflected that in the estimate. Good luck. And let's hope it gets the top end of the estimate. Told you they'd start at three figures. 10, may I? At £100. 110, 110, the book's out. and I sell then at 110 and done. Thank you. It was straight in, really, and straight out. £110. and away to a new owner. Michael's John Piper decorated table. -And you've had it ever since. Gosh. He's got his money's worth. and only one isn't made of wood. ..but for some unknown reason, I kept hold of this. then I had it again and then back in the attic it went. Can you remember how much you pay for it? No, I've been trying to think, but no, I can't. Well, I'm sure you're going to make a healthy profit anyway. We're going to find out what it's worth right now, it's going under the hammer. St Paul's and St Martin's. And 60, and 5. And 70, and 5. 80, and 5. 90, and 5. At 140. 50 on the net bid. At £180, in the room. Any more at all? The net's out. At £200, in the room. at £200 and done. Thank you. Hammer's gone down. £200. Top end of that estimate, well done. -and the affiliation with cathedrals with John Piper. -So someone's got a nice thing. -They have. Hope they enjoy it. Now for our next lot, and I'm joined by Alison. it's my turn to be the expert. Mappin & Webb, under the hammer. It's been in the wardrobe for a long time? Yes, it has, unfortunately, doing nothing. What would you do with it? -Well, at least it's been kept in great condition. Here we go. This is it. The, er...super Mappin & Webb case. It's not going to sell. is there any more at all? No? Well, I'm sorry, I can't do that, chaps. -will probably have a word with Philip. -I don't want to stick it in the wardrobe! it's better off in a saleroom. You can't let one "no sale"
because blink once and you'll be back on track with a winner. -who's just joined me right now - hello, thanks for coming in. -..which you collected at the valuation day. -I was in such good company there. -that's what's so good about it. They're big names, aren't they? -they could have been a bit snooty about it. No. They were all very good. so I think that should get them away at the top end of the value. -OK? We'll find out right now. Here we go. At £280. On the book. 290. At £290. Who's got 300? On the telephone, at 300. -that are making this really, really fly. 600 bid. On the telephone. and I sell then at £600 and done, thank you. -What are you going to do with all that money? -Don't forget there is commission. Well, that's what girls do. -And you've got to keep them happy. Thank you so much for coming in, and what a lovely surprise that's given us at the end of the day. Sadly we're running out of time, I hope you've enjoyed the show. Join us again for many more surprises to come on "Flog It! ", but until then, it's goodbye from Malvern. Paul Martin is joined by experts David Fletcher and Adam Partridge at the Pittville Pump Room in Cheltenham, as they continue their search for rare and interesting items, and hear the stories behind them. Paul finds out whether his celebrity status will help an autograph hunter cash in on his collection, Adam finds an item that is every auctioneer's dream and David checks out a German-made train set. Paul takes time out to visit the lady of the manor at Sudeley Castle.